May – Beauty and Bounty! A late start in our coastal SoCal gardens is not a problem! Plant the same as you would in April plus now is perfect time for cantaloupes! If you are doing winter squash this year, better from transplants now. If your garden has had soil fungi that sickened your tomatoes, a later start is to your advantage. The soil has had time to warm and dry a bit, killing off some of that fungi. 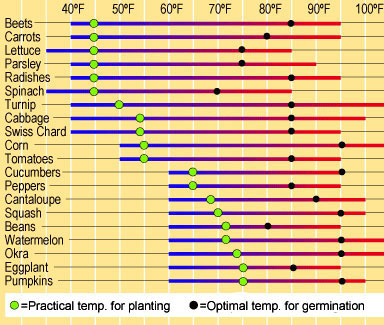 Those of you that did late March, early April plantings, plant your 2nd rounds now or later in the month! It’s still good timing to sow seeds of lima and snap beans, beets, cantaloupe, carrots, celery, chard, chicory, chives, slo-bolt cilantro, corn, leeks, heat tolerant lettuces, melons, okras, green onions, peanuts, peppers, pumpkins, soybeans, warm-season spinaches, squashes, sweet potatoes, and tomatoes. At the same time put in transplants of what you can get, and you will have two successive plantings in at once! Choose bolt resistant, heat and drought tolerant varieties when you can. Smart Companion Planting! WHITE radishes with cucumbers repel cucumber beetles. Interplant cucumbers and beans to repel cucumber beetles and prevent the wilt diseases they carry plant to plant. Cucumber beetles are literally deadly; they are NOT cute. Plant your cukes on mounds with a little well on top; alternate with beans planted low next to them. The both need plenty of water, but the cukes need the soil to dry bit to help keep the wilt away. Water carefully so as not to degrade the mound/well. Check them time to time and restore if they need it. If you will be pickling, tuck in a couple lovely dills here or there. When they flower, they are perfect bee food. Also plant radishes with eggplants as a trap plant for flea beetles. Flea beetle damage, little pin holes, seems so less severe, but it slows the growth of your plant way down, and there is little production. Plant your favorite varieties of potatoes to repel squash bugs. Long beans like it really hot. Wait until June to plant them. Also, they are the last bean producers, filling in at the end of summer when your other beans are finishing. When they are happy, you won’t believe how quickly they get that long! Certain varieties don’t get mildews! Their taste and texture is slightly different than our standard green beans, but delish also! I hope you planted your garlic, bulb onions, and shallots in their own little patch, because later this month, when foliage on begins to dry naturally, stop irrigating. Dry outer layers needed for long storage will form on the bulbs. When about half of the foliage slumps to the ground naturally, bend the rest to initiate this maturing. The bulbs will be ready for harvest when the foliage is thoroughly dry and crisp. Healthy everbearing strawberries will be producing like crazy, maybe your June bearers too since we have been having early warm weather! Give them a fish/kelp mix feed, now and after each heavy fruit-bearing period for continued strong growth and fruit set. One of our gardeners fed his every other week and his harvests, in shoe boxes, were outstanding! Know that fishy stinky stuff also attracts skunks and other foragers, so use something else, like Bunny poop if you can get it. 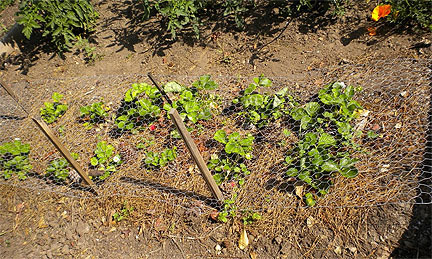 Avoid mulching with salty manures, especially chicken; strawberries don’t like it. 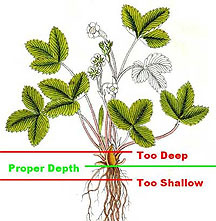 Water short rooted varieties of strawberries more frequently, as well as keeping your beans and cukes well watered. They are all workhorses producing fast and repeatedly, cukes making a watery fruit even. In this drought year, summer mulching is an absolute! Self Mulching is the cheapest, easiest technique! Transplant seedlings close enough so that the leaves of mature plants will shade the soil between the plants. If you choose to do this, alternate plants that get the same diseases or pests with plants that don’t get the same diseases or pests. That’s all there is too it! Roots are cool and comfy, less water needed. Natural mulches feed your soil as they decompose. Avoid any that have been dyed. Mulch keeps berries, cukes, squashes up off the ground, less likely to be chomped by snails and soil critters. Soil diseases don’t have access to susceptible leaves. It prevents soil splash so you have a clean harvest. Again! TOMATOES! At gardens that have the Fusarium and Verticillium wilts in the soil, choose your tomato varieties with that in mind. Heirlooms don’t have as much resistance as the toms that have VFN or VF on their tags or seed packets, like Ace, Early Girl, Champion, Celebrity. The V is for Verticillium, the F Fusarium wilt, N nematodes. Your next choice is whether to buy determinates or indeterminates. 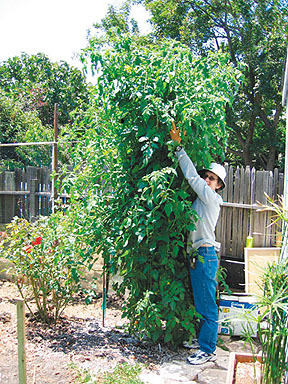 Determinates grow about 3 to 4′ tall and quit, producing lots of toms all at once, great for canning. Indeterminates vine forever all summer long, fresh table tomatoes every day! If you have soil wilt problems, planting determinates, successively, and replanting (not in the same spot) as you lose plants, may be your best solution. In these times of drought, and you have no soil wilt problems, indeterminates are the way to go so you aren’t continually watering plants that aren’t producing yet. Unless, of course, you are going to be canning. 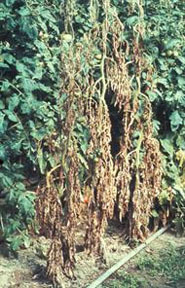 Special care is needed for tomatoes in wilt infected soils. La Sumida has the largest tomato selection in the Santa Barbara area! Reminder ~ Water Wise Practices! This California drought year consider planting IN furrows, where the moisture settles and the plants’ root areas will be slightly shaded. Rather than losing water to evaporation from overhead watering, put the water right where it will do the most good and nowhere else. And, PLEASE MULCH. It keeps your soil cooler, moister, less water needed. Sprinkle Mycorrhiza fungi right on the roots of your transplants when you put them in the ground. They increase uptake of nutrients, water, and phosphorus that helps roots and flowers grow and develop. Ask for them at Island Seed & Feed in Goleta. Always! Plant Bee Food, Herbs and Flowers! Sow or transplant basil, borage, chervil, chamomile, chives, cilantro, comfrey, dill, fennel, lavender, marjoram, mint, oregano, rosemary, sage, savory, tarragon, and thyme. Be mindful where you plant them… Mediterranean herbs from southern France, like lavender, marjoram, rosemary, sage, savory, and thyme, do well in hot summer sun and poor but well-drained soil with minimal fertilizer. On the other hand, basil, chives, coriander (cilantro), and parsley thrive in richer soil with more frequent watering. Wise planting puts chives where you need to repel Bagrada Bugs, by your broccoli, kale, but away from peas if you are still growing some. Cilantro, a carrot family workhorse, discourages harmful insects such as aphids, potato beetles and spider mites, attracts beneficial insects when in bloom. Dill is a natural right next to the cucumbers since you will use the dill if you make pickles. They mature about the same time. Let some of your carrots, lettuces, cilantro, broccoli, chard, radish, bloom! Bees, and insect eating birds and beneficial insects love them and you will get some seeds – some for the birds, some for you! Grow beauty – cosmos, marigolds, white sweet alyssum – all benefit your garden in their own way! Born May 30, 1835, poet Alfred Austin: The glory of gardening: hands in the dirt, head in the sun, heart with nature. To nurture a garden is to feed not just on the body, but the soul. See the entire May 2014 Green Bean Connection Newsletter! 10 Easy Steps to Make RICH COMPOST! I love Val Webb’s image and she and I both love COMPOST! She says: There’s an irresistible alchemy involved when you can start with garbage and end up with a wildly nutrient-rich substance that has been likened to Ghirardelli chocolate for earthworms. Composting is EASY! Start Now! Get your soil fat! 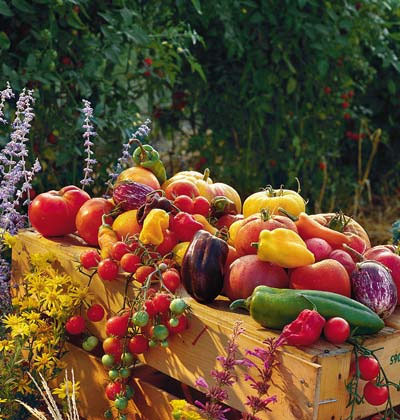 The sooner you plant, and plant in tasty soil, the sooner you get a great harvest! There’s compost and vermicompost, hot and cold compost, compost in place, trenching, to name a few. You have options! Compost is decayed organic matter – poops – that’s manures, dry leaves and straw/alfalfa, wet grasses and kitchen wastes. Compost has a variable amount of Nitrogen in it depending on what has been composted and how the compost was made. Some studies show unturned compost has more Nitrogen than turned compost. Homemade compost can be up to 4 N, as is fish emulsion and chicken manure. Steer is 2, horse 1.7. If you need a quick boost for a yellowing N starved plant, go for bat guano, or easily assimilable blood meal, both at 10 N! Be careful with that bat guano, it’s hot and can burn your plants. And both are pricey. Get just the amount you need at Island Seed and Feed’s bulk bins. Vermicompost is worm poop. Politely, worm castings. Simple as that. Red wriggler worms are easy to raise, will eat lots of things but do best with tender stuff, your green kitchen waste. They love cantaloupe and melon rinds, nesting in avocado shells, egg shells keep their pH neutral. Wrigglers are surface feeders not earthworms. If you put wrigglers in the soil, they die. Worm castings (vermicompost) have negligible N, about .05, are NOT A FERTILIZER, but do a lot of other good things for your plants. Highly recommended. Hot compost has to be made carefully, have just the right mix, be tended like a baby, and defies many attempts to get it hot! If you don’t get the combo of your materials right, you are cold composting. The advantage of hot composting is it is fast, kills bad creatures and weed seeds. Also kills the good guys. But. Only in the parts of the pile that actually get that hot. The whole pile never gets that hot, like the outside of the pile. Even if you turn it so the outside goes inside, it’s hard to guarantee it will all get that hot, so be advised. It’s pretty cute to see all those little plants that spring up in the pile…. 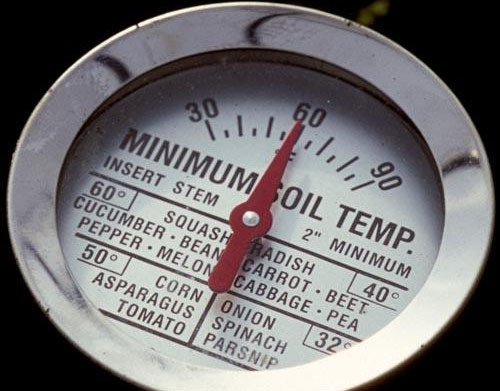 Cold compost is just throwing your done plants or trim, preferably not diseased or pest infested, into a pile or your compost enclosure, layering with some wet or dry material as needed. It might get hot, it likely won’t. It will decompose if you keep it moist. If not you have dead dry stuff, no nutrients. Some studies have shown that cold compost is more nutritious than hot compost. Makes sense since you aren’t burning off Nitrogen and other goodies including beneficial insects and microorganisms. If your stuff doesn’t turn black and fluffy and smell good when it is decomposed to unrecognizable pieces, you don’t have compost. Perhaps you could use it as mulch? Composting in place, sheet composting, Lasagna Gardening, is a time saver, no moving later. Chop and drop on the spot, add dry/wet materials as needed, amendments, red wrigglers, let nature do the work. Especially add some chicken manure before you add your layers, because decomposition uses Nitrogen! If you are starting on top of turf, using cardboard as your bottom layer, be sure to SATURATE the cardboard. Don’t rush this part. Really saturate it. You want it to last long enough for the grass underneath it to die, to keep the grass from growing up through your pile; you also want your cardboard to decompose so your plants’ roots can grow through it when your pile sinks as the pile decomposes. Trenching kitchen trim is traditional – cover it and forget it! Crushed eggshells, torn tea bags, coffee grounds. Six inches deep is all you need to do. Cover with the soil, water as usual, your stuff will disappear in about a week! Don’t put in meats or oils that attract digging predators, or grains or cereals that will attract mice. Leave out citruses and spicy foods. Start Now! 10 Easy Steps to Make RICH COMPOST! Make the most out of your finished plants or trim; use them for compost, organic fertilizer! A compost enclosure is a fine garden investment! Keep it humming! Dig your compost in around your plants, plant IN your new compost! Surface compost Nitrogen just off gases, so put a layer of soil over your compost to keep the Nitrogen right where you need it, in the soil feeding your plants. 1. Get or make your enclosure, a good working size for you, then layer, layer, layer! Half inch layers are ideal, but do what you can. A pile 3′ by 3′ is your best minimum if you want a hot pile. Enclosures can be free pallets on Craigs List tied together, plastic beehive types to keep the rats and mice out, the circular hard black rubber kind, to expensive rolling types, garbage cans with bottoms removed, holes made in their sides! Do what works for you! 3. Layer up with your kitchen waste you saved, undiseased green waste from your garden or greens recycle bin. Avoid hard woody stems and seeding weed plants. Cut up large items, halve whole items like apples, potatoes. Tear teabags, crush eggshells. 4. Lay in a few yarrow leaves to speed decomposition. Grow yarrow by your composter for handy use. 5. Inoculate with a sprinkle of soil, living micro organisms, that multiply, munch and speed composting. 6. Sprinkle your layers with aged manure (keep a bucketful next to your composter) to enrich it. 7. Keep layering up to 3’ high or until you run out of materials. 8. Keep your composting materials moist, to keep them live and decomposing. Don’t let them dry out – dry is dead, nothing happens, nutrients are lost, time and space wasted. 9. Cover with a large piece of *folded heavy mil black plastic to keep your compost moist, and dark so any worms that take up residence work up through the whole pile, to the top . 10. Keep adding to it, stir or turn often to oxygenate, weekly if you can. Composting organisms need lots of air to operate. Keep it moist but not drippy and drowning. Some studies show compost is more Nitrogen rich if you DON’T turn it! Hmm…read on. If you are not able to do that much heavy turning or don’t want to take the time, simply, push a long stick into your compost, several times, in different places, to let oxygen in. Or, if you are inclined, at intervals in your pile, as you build it, you can insert, horizontally or vertically, 2″ PVC pipes, that have had holes drilled in them every 6″ for aeration. If you are going to insert horizontally, make your holes on one side only; put the holes side down to keep them from clogging. Make sure both ends stick out so there is air flow through the pipes. If you insert vertically, drill holes all around the pipe. If you use a larger diameter, line it with wire mesh to keep it from filling with debris. Once made, you can use your PVC over and over. Other alternatives are to make wire mesh cylinders or tie a bundle of twigs together. Your compost is finished when you no longer recognize the individual materials that went into it. If you are have a small compost batch, when ready, lay out your *folded plastic cover, pitchfork the still decomposing stuff on top of your pile onto your plastic. Use that good stuff at the bottom where you want it. Or plant in the nutrient rich spot where your composter was! Put your composter in a new spot, fork the stuff still decomposing back in, add new materials, recover, do it again! The process slows down in winter, speeds up in summer, generally you have some compost in 6 to 8 weeks. If you have time, throw a cup or so of compost in a bucket, fill with water, let sit overnight, voila, compost tea! Soak your seeds in it before planting! Pour it round your plants or use your watering can to spray it on their leaves, both tops and bottoms – foliar feeding. Your veggies will thrive! If you have a lawn, make aeration holes with your spade fork and pour the tea down them. You soil will start to live again! Your soil and your plants thank you! Rainy Day Tips! Before, During, After! Fertilize before a rain so the fertilizer will soak in. 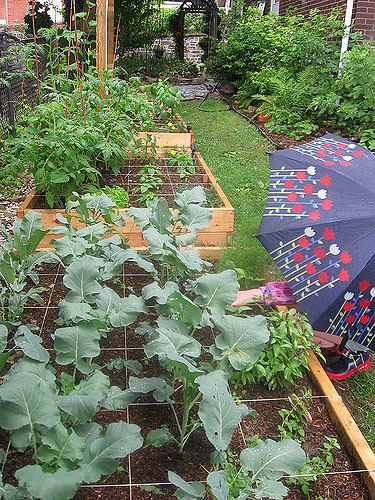 Take the cover off your compost to let it get wet. Tie or stake plants that may topple from wind or weight. Set up to harvest rainwater for later use! Make raised beds, mounds, to help with drainage issues. Mulch to keep soil from splashing up on your plants, keeping your harvest clean, holding water in place to soak in, and keep soil from eroding. Make ‘permanent’ pathways with boards, stepping stones, straw bedding, so you won’t be compacting your planting area soil when it is wet or dry! Plant for air circulation so foliage dries quickly. Plants too closely spaced, make a warmer micro environment, tend to get mildew easier. Drench your young plants with a mix of a heaping tablespoon of baking soda, a 1/4 cup of nonfat (so it won’t rot and stink) powdered milk in a large watering can of water for mildew prevention and abatement. It works for certain other diseases as well! Water less frequently and at ground level, not overhead. If you didn’t before, get out there in your rain gear and add some manure or fertilizer! Great excuse to play in the rain! Check frequently to see how your plants are doing. Secure any tall plants, trellises that need it. If a plant is too low and in standing water, raise it. Put your shovel deep under it, put some filler soil underneath the shovel! Add more mulch if it has shifted or wasn’t quite deep enough to keep mud spatter from your plants. Be sure your wormbox worms are not doing the backstroke! Rebuild any drainage channel that has weakened, clear if clogged. Make sure all your rain harvest system is working well. Kudos to you for harvesting! Practice arm-chair gardening! Read garden books, magazines, browse web sites, buy some seeds from mail-order catalogs, design your new garden layout! Get some seeds, soilless potting mix, gather containers with, or make, drainage holes. Start some seeds! If the rain is prolonged, uh, do an aphid, snail and slug check as frequently as you can. Sluggo works on snails and slugs even when it is wet. Hard to believe, but, yes, it does. If the rain is prolonged, do harvest your fresh and crunchy produce! Lettuces will flourish! Check on fast maturing broccoli and cauliflower heads to cut at peak maturity! Gather your luscious strawberries. Keep your peas picked to keep them coming! Do some thinning for air circulation as makes sense. Often there is a growth spurt, and you can see where thinning is needed. Repair areas where soil has washed away exposing roots. Put some mulch on. It’s often warmer after a rain, and it is the warmth that mildew loves! Drench mildew susceptible plants with your mildew mix immediately, early in the day so your plants can dry. If you prune mildewed areas off, remove those prunings, wash your hands and pruners before you go on to other plants. Do what you do about snails and slugs. Keep checking for aphids – blast them away with water or remove infested leaves. There is often more gopher activity after rain has softened the soil, so be ready! In later days, after the rain, harvest first, water second! That’s the rule to keep from spreading diseases spread by moisture. Enjoy the superlative rapid growth of your very happy plants!